So You All know Peter Kenneth but do you Know His Running Mate? - Ghafla! 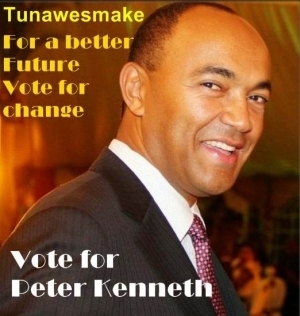 So You All know Peter Kenneth but do you Know His Running Mate? We all know Peter Kenneth as the presidential candidate running on a platform of achieveable development goals and not just tribe aye? But do you know his runningmate? Well, Team Ghafla would like to introduce you to him! “Ronald Osumba is a Kenyan national. He was born in August 1979 in Kibera where he also grew up and went to school. He attended school at Olympic Primary School in its hey days as a national academic giant. While at Olympic, he registered a sterling performance which earned him a place at the Starehe Boys’ Centre. At Starehe he was immediately thrust into several leadership positions and continued with his good academic performance that saw him join Moi University to study Business Administration. Osumba was an active member of the university life and leadership where he exhibited his prowess in the arts, academics and student leadership. For instance, he chaired the Student Electoral Commission in his final year-a difficult and sensitive task that he handled with professionalism and dignity. One of his biggest achievements that still reverberates in the country today was to lead a team that founded the Kenya Model United Nations Universities Chapter in 2001/2002 which has now grown to cover all public and private universities. He served as its First Secretary General and continues to serve in an honorary capacity. Ronald is married to Vera and they have been blessed with two children. A 4-year old daughter and a 4-month old son. Ronald has 10 years of experience in the private sector. He has led successful teams in the areas of business development and thought-leadership, brand management, relationship management and financial management. He has previously worked at Co-operative Bank, Impax Business Solutions, and Health Data Systems in senior management roles. He was the Senior Sales Manager for Public Sector at Safaricom Limited immediately preceding his appointment as Peter Kenneth’s running mate in the Eagle Alliance. As mentioned above, Ronald Osumba has a weight of knowledge and experience in leadership in the private sector. He is also well-versed in national development issues specifically those directly relating to the youth. He is the Chairman of Board in Youth Entrepreneurship and Sustainability (YES) Kenya and a key member of the Managing Committee Starehe Boys’ Centre & School where he also chairs the Old Starehian Society (OSS). At the alumni association he leads and is respected by a host of industry captains, senior government officials, political and community leaders. Ronnie’s forays in public life and service have afforded him an opportunity to experience and understand the daunting challenges of the young people in this country. Ronnie has overcome all odds to become a person deeply engaged in youth development with a sole aim of inculcating values into young people that model them into leaders who are in touch with challenges in the 21st century. His core values are well-embedded in a philosophy of focus, perseverance and excellence.